Girls are motivated to pick up things that fit into their environment, specifically their rooms. And, whether they pick it up impulsively or plan for it has more to do with the item?s uniqueness, placement in the store and color appeal than anything else. ?The trend for girls in impulse purchases is BLING!,? according to Mike Murphy, business development director of Blue Box Toys, who has been watching retail markets for more than 30 years. ?Even girls as young as 7 to 10 years old are interested in three things: fashion, music and boys. They are interested in their room and all the trinkets that decorate and fill that space.? At Russ Berrie and Co. , CEO Andy Gatto says most of their sales are generated by impulse shoppers. He tries to ?tie an emotional reaction with a product [that has] some practical application.? 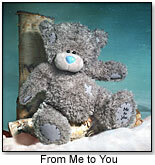 In June, RUSS launched a line of tattered teddy bears called From Me to You. Already popular in Europe, they deliver generic, occasion-driven messages. At Scottsdale, Ariz.?s The Doll House, books are the biggest impulse buy. ?It?s one of the first things they see,? explains owner Sari Powazek. She notices that girls mostly pick up personalized name sticker books that she gets from Mulberry Studios in England. Product placement is also key at Ingenious Toys in Kansas City, Mo. Sales associate Matthew Davis says girls reach for dolls first from the under-$10.00 bin set near the front of the store. Key chains by Ugly Doll go quickly at Playthings in Madison, Wis. Manager Mel Eslyn says they sell a lot of the handmade ?supposed to be ugly, but they are cute? key chains for $5.99. ?People are always picking those up!? Owner of Sandcastle Toys in Newport Ore., Bill Gaylor, reports that the fastest selling item is ?whatever I put on my counter.? Small items, such as bracelets, rings and tween makeup, all do well there. ?Right now I have a stack of Crocodile Dentist games from Winning Moves Games that is selling well there.? And when does he change to a new product? When he runs out. One of Colours USA?s most popular small cosmetics kits is the Butterfly Lipgloss Kit, which retails for under $5. Lynn Perez, vice president of sales, says they will have a variety of holiday gloss toppers to entice impulse stocking stuffer purchases this holiday season. At Terrific Kids Inc., in Rehoboth Beach, Del., crafts are high on the list for girl shoppers. Although many crafts kits sell well, girls ?tend to go toward the jewelry making or nail decorating kits,? according to Pam Grove, store manager. Made By Hands has a Make-Your-Own series that includes cards, games, stationery, frames, postcards, scrapbooks and more. The colorful packaging and creative product can inspire an impulse purchase on its own, but new travel-size kits coming soon at the request of customers and retailers will make the kits even easier to pick up. Books on CD by Joy Stories (ToyDirectory) feature a series of lovable animals coping with hospital stays, moving, bullies and other childhood dilemmas. The company hopes the optional accompanying puppets will catch the eye and the ?aaahh? reaction of young girls in a way a simple CD case might not. The CD retails for $14.00 but when sold with a puppet, the package sells for $20.